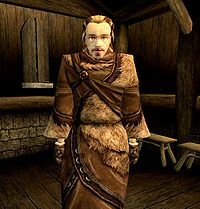 Korst Wind-Eye is a Nord shaman and spiritual guide of the Skaal Village. He is located in his hut next to the Greathall. Korst will send you to perform a ritual at six standing stones to restore the Oneness. He lives in a small one room house in the Skaal Village. To the right of the entrance, there's a table with a journeyman's mortar and pestle, a chokeweed, a fire petal, and a gold kanet. Around the table, there are a few containers of clutter and the book The Five Far Stars, on ledge above the table. To the left of the entrance, there's a few benches and some clutter. At the back of the house, there's a hammock, a bottle of greef near the hammock, a fireplace, and some clutter. He is wearing a common robe with matching shoes and a pair of gloves and he is wielding a Nordic silver mace. Aside from his natural resistance to shock, immunity to frost, ability to shield himself, and a natural frost damage spell, he knows the following spells: Wild Distraction, Drain Enchant, Drain Destruction, Drain Illusion, Drain Conjuration, Drain Mysticism, Drain Medium Armor, Drain Blunt Weapon, Drain Athletics, Drain Sneak, Drain Acrobatics, Medusa's Gaze, Strong Spelldrinker, Strong Reflect, Wild Spelldrinker, Absorb Agility [Ranged], Absorb Endurance [Ranged], Drain Blood, Absorb Luck [Ranged], Absorb Personality [Ranged], Absorb Speed [Ranged], Absorb Strength [Ranged], Absorb Willpower [Ranged], Blood Despair, Fortify Blunt Weapons Skill, Ghost Curse, Toxic Cloud, Call Bear, and Call Wolf.